The annual new Pinotage Vintage Tasting was held on Thursday 14 June at Allée Bleue outside Franschhoek. Wines from different areas were selected from these wineries: Perdeberg, Wellington, Rooiberg, Neethlingshof Estate, Stanford Hill, Simonsig, L'Avenir, Riebeeck Kelder, Klawer, Brandvlei, Stellenbosch Hills, Fairview and Du Toitskloof. The wines were all a work in progress, being either tank or barrel samples, but the event gives the first opportunity to judge the overall quality of the new vintage. Charles Hopkins, vice-chairman of the Pinotage Association, presented the tasting. He said “The wines that were tasted came from various wine-producing areas, with diverse climates and soils, and are aimed at assorted local and international markets, from the lighter style for high-quality drinking wines to the more complex wines." Francois Naudé, award-winning winemaker who is famous for his Pinotage made when at L'Avenir Estate, rates 2007 as one of the best four vintages ofthe past decade. Pinotage is South Africa’s second-largest volume of bulk export wine, after Chenin Blanc, (7 .1M litres from May 2006 to April 2007). 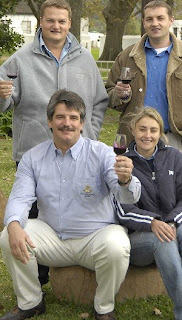 Co-owner, and cellarmaster of Simonsig, Johan Malan said that their 2005 Pinotage sold out some time ago and that there was already huge demand for the 2006 vintage. “Pinotage is a top-seller, so it must be in fashion. That’s the reality of the market,” says Johan. Klawer Co-op Birdfield Pinotage 2007 - It is a big and complex wine, with flavours of prunes and bananas coming forward. Farmyard was also detected on the nose. This wine will do well once matured and will do good in the UK and Europe market as a commercial wine. L'Avenir Pinotage 2007 - This wine also really stood out for me. It is a complex and well-balanced wine with a low yield of 5 ton/ha. They only used French Oak and 85% was bushvines. It has been in the barrels for 4.5 months at the time of the tasting. They keep the wine on the wood for 12 months in total. Perdeberg SAAM Pinotage 2007 - Mocca Cappichino flavours stood out on this medium-bodied wine. Fruitiness is also detected with a silky finish and tannins on the palate. Rooiberg Reserve Pinotage 2007 - First Fill 100% French Oak was used. There is smokeyness and a hint of perfume on the nose, with earthy mineral-ness that lingers. It has a straight finish. This wine is a good pinotage to me, the wood compliments the grapes/flavours. One of the better ones. Stanford Hills Jackson's Pinotage 2007 - This wine has ripe plums, camembert cheese flavours and is fruit driven. Wood that was used is Hungarian & French Oak and it pushes the tannins to the front of your tongue. Good balanced wine and opens up when left for a while.